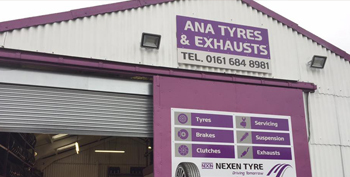 A N A Tyres and Exhausts have been established since 1990, and bring a wealth of knowledge to the car repair industry specialising in tyres, exhausts and mechanics. We are a family run business and after our 22 years in the industry, we are still going strong. We offer a pick up and collection service to any office and workplace of your choice. Our prices are very competitive. We have been in the tyre trade since we opened in Failsworth several years ago. Experienced in car exhausts, we have an extensive product range of new exhausts for your car or Van and only use the best systems such as, Bosal, Timax and Walkers. No more rushing to get to the testing station or taking time off work to pick up your car. We offer a pick up collection and delivery service to your home, office or place of work. Just let us know when is convenient to pick your car up and we will arrange for one of our fully insured drivers to collect your vehicle and return it when your work has been completed. Pick UpService is offered within a 15 mile radius of our premises. At A N A Tyres and Exhausts we can undertake full MOT testing of your vehicle. So if your vehicle is due an MOT don't forget to contact A N A Tyres and Exhausts. Remember, a car that is three years old is MOT due.